Thanks to Llwydd for the french translation of the AddOn. 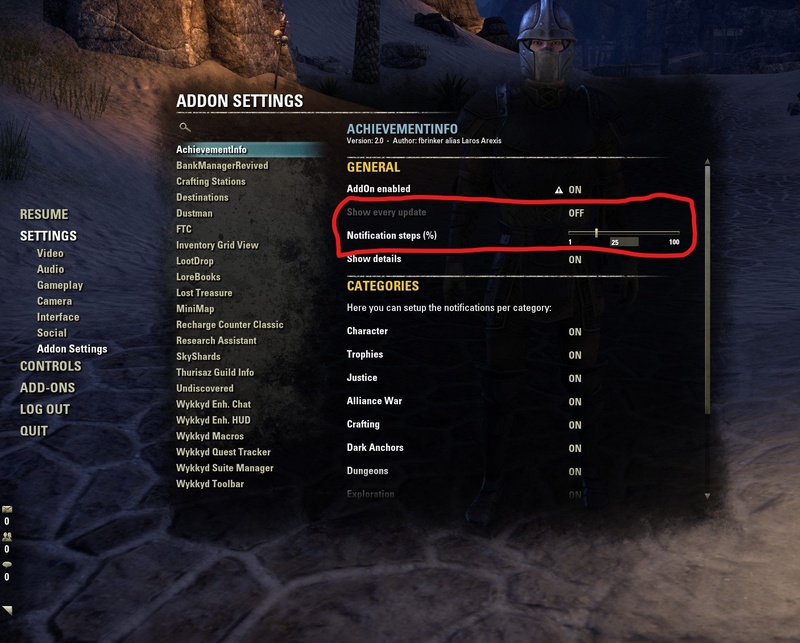 What is this AddOn about? I like achievements and i like to know what to do to complete them and what type of achievements exist without browsing through the entire achievement catalog: This AddOn displays lightweight chat notifications if you make progress in an achievement (please see the screenshots). Was hat es mit dem AddOn auf sich? Ich mag Erfolge und weiß gerne was ich tun muss um diese zu erledigen und was es überhaupt für Erfolge gibt, ohne das ich mir jetzt alle im Detail anschauen muss: Dieses AddOn zeigt einfache Chat-Benachrichtigungen an, wenn man einen Fortschritt in einem Erfolg erzielt (siehe die Screenshots). There is still an existing incompatibility with pChat regarding long notifications. pChat cuts off too long messages, I'm not sure why yet. 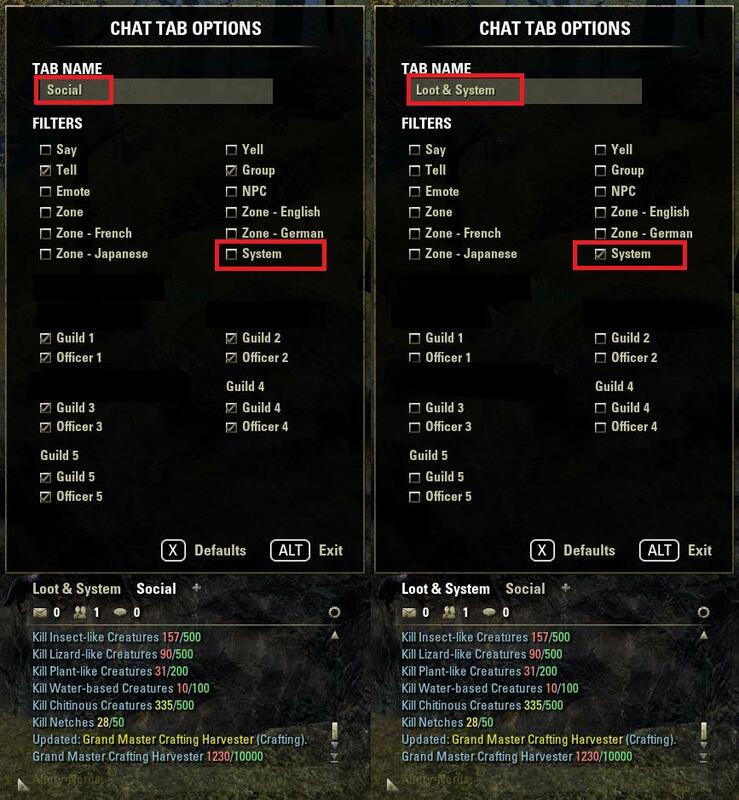 Would you please consider adding an option for Account Wide Settings. First of all, I love your addon. I love the way it displays ACM's in Chat. I love that you can have it line by line. that it starts to ignore the sytem message options you make. Thank you for the compliment and the detailed report. But I have to admit that I couldn't reproduce the issue. Looks good to me. There wasn't any output in the "Guilds" tab too. I've tested this with my current version of the addon I will release in a few minutes. It shouldn't fix anything, but who knows. Please let me know if it changes anything for you or if the error still exists. Last edited by Asto : 02/10/19 at 07:49 AM. I use the german client and also pChat. If there is an achievemnt update, I get the followoing chat output. I've tested around a little bit but can't reproduce this in my currently updated version. Is this an ongoing bug? When does it occur? Only with specific achievements or a specific achievement category? Last edited by Asto : 02/10/19 at 06:41 AM. When you get a chance, could you please update the addon? I don't load outdated addons because I never know if they will cause issues. Thanks. I know new jobs take a toll on family life and extra-curricular activities. Last edited by Asto : 02/10/19 at 08:00 AM. I have read all 41 comments in here. BUT it seems to not affect AchievementInfo anymore. I know you are busy and that's fine. But it would be nice to have a fix some day. I have used all these Addons together before and all worked fine. Only AchievementInfo started to do what it wants. Stored all Addons in a Backup folder and added them back 1 by 1. I have mixed up different settings. Disabled pChat and used LUI for System message output. Everything I tried doesn't help. All I wish is to see my Chat like it was before. Thanks in advance for reading / trying to help. Would it be possible to set a shortkey for opening the last updated achivement detail window? Last edited by Asto : 04/14/18 at 06:54 PM. something like: if this achievement update was posted in the previous X min, then do not send message to chat. Thank you very much. There should be an option for that in the settings already. Last edited by Asto : 04/14/18 at 06:55 PM. in the chat when i pick up an item that also gives Bast I see in the chat window the correct Bast number but it is titled Regulus. 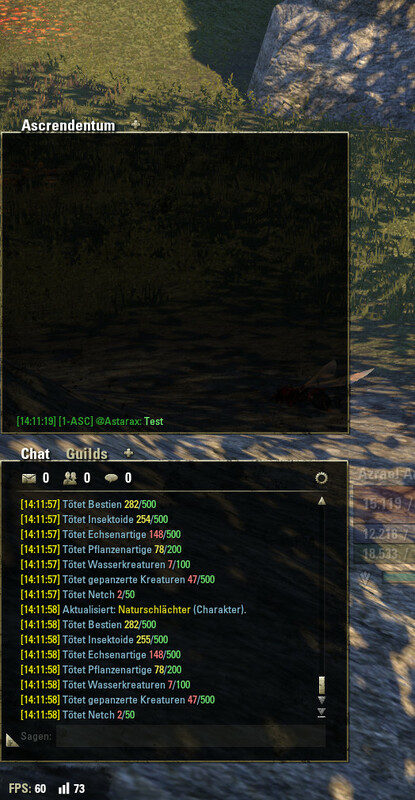 I fetch the data from the game API, so this seems to be a problem in ESO itself. I didn't add any own texts (excluding the settings menu). Is that achievement the only one where you encountered such an error? Re: is there a way ? i love how the Achievement Info is listed in detaled in chat but is there a way to have it just list in 1 chat tab and not all the tabs at the same time ? pChat enables System-Messages in every Tab by default (that's the default output for chat messages). You can disable them in the tabs where you don't want to see them.